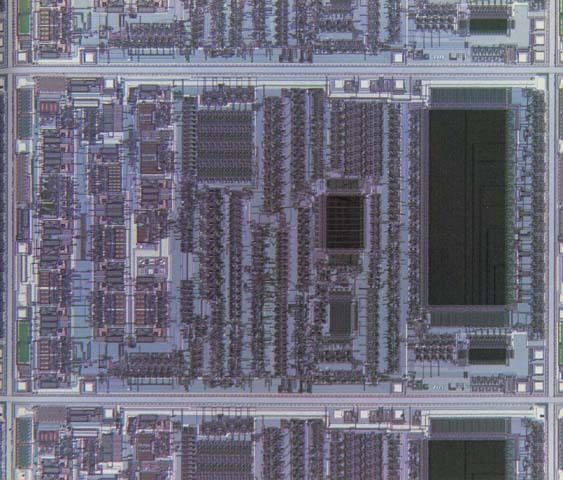 The S3610 speech synthesizer chip, shown here on a wafer, can store up to thirty-two words, or seventeen seconds' worth of speech, in its own 20K ROM (the large grid on the right). Hooked up to four separate 128K ROMs, its storage capacity can be boosted to seven minutes. Most of the circuits on the chip are used to decode information stored in the ROM and play it back. Actual size: 0.170 x 0.279 inches. ©Copyright Stan Augarten This book is provided for general reference. The National Museum of American History and the Smithsonian Institution make no claims as to the accuracy or completeness of this work.